At first glance the new Canon Powershot A1100 IS looks very similar to its bigger brother, the A2100. I reviewed both cameras at the same time and actually preferred the slightly cheaper A1100 model in many ways. Although offering a smaller, lower-resolution 2.5 inch LCD screen and shorter 4x zoom lens, the A1100 is noticeably smaller and lighter, offers a faster maximum aperture of f/2.8 at the wide-angle 35mm focal length, has a true optical viewfinder, and benefits from having a curved hand-grip area. Whilst the A2100 will fit into a trouser pocket or handbag, the A1100 easily fits, which means that you're more likely to carry it around with you. The Canon Powershot A1100 IS builds on the key strengths of the previous A1000 model by adding even more beginner-friendly features. The A1100 is a compact camera that produces excellent images in good light and which covers a versatile focal range for such a small camera thanks to the 4x zoom lens. The wealth of different scene modes on offer are now accompanied by the ultimate point-and-shoot Smart Auto and Easy modes, which really do take the guesswork out of using the A1100 and make it suitable for all the family. Other beginner-friendly features include Face Select & Track, which is a great way of focusing on who really matters in your photos, and FaceSelf-Timer which easily allows you to take part in those all-important family group shots. The move to more megapixels - up to 12.1 from the A1000's 10 - thankfully hasn't come at the cost of image quality, although the A1100 still suffers from less than stellar images in low-light due to obvious noise appearing at ISO 400 and faster. Other key disappointments include that low-resolution LCD screen and an even slower continuous shooting speed of 1.1fps. Disappointingly for UK buyers, the launch price has shot up from £169 to £219, although to be fair to Canon comparable price rises are happening across the industry as Sterling struggles against the Yen. 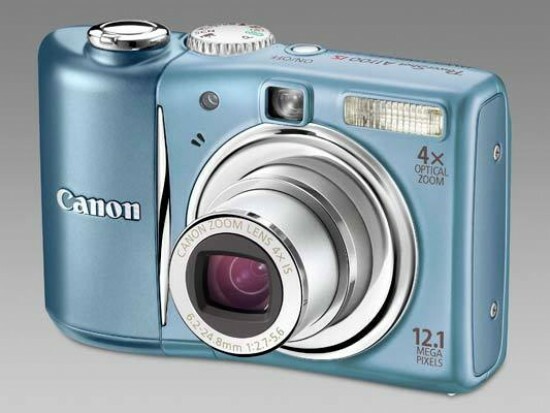 Overall the Canon Powershot A1100 IS adds a number of improvements to an already attractively designed camera, making it even more ideally suited to its family target audience.